With more individuals getting involved with health, fitness and wellbeing than ever before, the industry is experiencing an influx of popularity and attention. For example, more gyms are opening, with many extending their trading hours to 24/7. This movement extends itself to an increasing amount of individuals eager to get into shape, curious about different methods and techniques to customise this process to make it more enjoyable. One of these techniques, High Intensity Interval Training (HIIT), involves performing exercises at a higher intensity, in addition to smaller intervals or ‘rest breaks’. This is done to optimise the fat burning process in the body. Many commercial gym’s host HIIT sessions to promote the method, as it has proven to be one of the most effective training methods worldwide. This means there is no need to educate yourself on the process or exercise techniques, as personal trainers can teach you directly. This allows newcomers to approach their health and fitness with more ease. HIIT is also excellent for a range of physiological and psychological measures, these include losing body fat, strengthening the cardiovascular system and improvement of fat and carbohydrate oxidation just to name a few. Your fitness goals will determine the best type of HIIT training to perform. It is found people who want to improve body mobility will benefit more from bodyweight exercises and those eager to burn fat should utilise a range of sprinting/running techniques. The other type of HIIT training, known as weight training, may involve performing an exercise on a gym bench for a number of sets with 30-second intervals. One major plus about HIIT training is that your workout time is halved and you won’t spend hours in the gym. This is because your intervals or rest breaks during your workout are kept to a minimum, hence the name: High Intensity Interval Training. The science behind HIIT training goes on to say that, with HIIT, you should alternate short bursts of very intense energy. For example, 10-20 seconds of sprinting with periods of low intensity activity, such as walking, for 1 minute. It is found that a metabolic demand is formed from higher-intensity periods, which is effective for fat loss and overall conditioning. Furthermore, the lower-intensity periods let you recover and use aerobic energy. There is one common misconception associated with HIIT training, which is that this type of training requires a lot of equipment and continuous maximal effort. These are both common thoughts from people who are keen to get into shape but are turned off by the idea of HIIT and would rather opt for a simpler way of losing fat that are commonly found on infomercials. 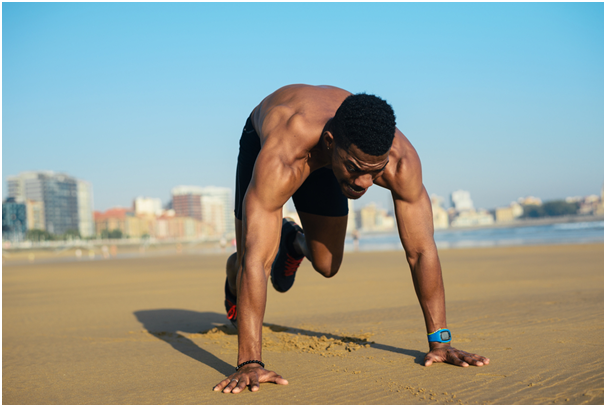 HIIT requires no equipment as simple bodyweight exercises can be incorporated and prove similar results. As for the comments on ‘maximal effort’, HIIT training only requires short bursts of maximal effort with the majority being slow, low-intensity movements. Sprinting for as little as 15-20 seconds with 1 minute walks in between can really go a long way in reaching your fitness goals. If you’ve always wanted to get in shape but struggled, perhaps this could be your solution. Get in the gym or get in the sun, work hard and see the results!